there are lots more out there. if you have found some good sites please comment with the link! 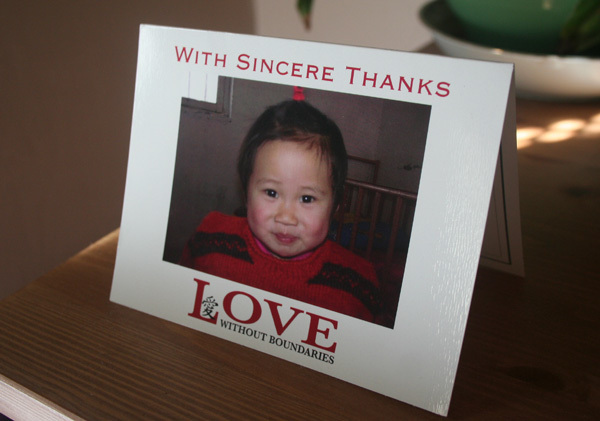 I received this very sweet thank you card from Love Without Boundaries yesterday. Handwritten inside it says, “Dear Melissa- Thank you for organizing your “Craft for China” sale on eBay and your donations for Education & Foster Care! Together, we are bring hope … one child at a time. Yours for LWB, Linda Phillipes”I thought it was very kind of them to send such a nice thank you card. last move before the child is adopted). I decided to go ahead and sponsor the little girl they have chosen. I picked Emma has her western/program name. Here she is! Today I was given the first report on Gracie. In this report it says she is 3, she must of had a birthday. There are rules on what can be posted about the children, to protect their privacy. I will not be posting the full reports on the children. It does say she walks in line to the beat of music and she likes collecting toys dropped by other children. How cute! It will be interesting to see how much she improves when I get the next report. I will be posting again when I get updates on the children. The first fundraiser auction started on September 22 and ended September 29th. It was a very good first fundraiser! We raised well over $600! Right now I am waiting on payments to clear so I can ship everything and select the children to sponsor. I will be making updates on the blog so keep checking back (or add to bloglines) for updates on the children! Hello everyone! I wanted to give everyone an update. I have received many of the donated items but I am still waiting on more to come. I really wanted to get the auction online this weekend but with out a lot of the donations I’ll probably have to wait. If I don’t put everything up this weekend it will definitely be done before the 21st of September. 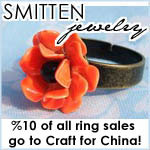 I am hoping to get a table at a local craft show/fair during the holiday season to have the next fundraiser. For that fundraiser any item can be submitted, it doesn’t have to be a one of a kind. If you want to donate items for that then fill out the donation form. I’ll post again when I know when the auction will be!